In my continuing series analyzing the Sarasota County November 2014 election results, I have focused on the Governor’s race and the School Board race. One interesting trend, however, is not just who wins but who wins the portion of the votes cast via Absentee Ballot, Early Voting, and on Election Day. Absentee ballots have largely been thought of to be a source of strength for the Republican candidates statewide, but the numbers in the November 2014 elections in Sarasota may show the opposite trend locally. In all of the most hotly contested countywide races, the Democratic candidate won the absentee ballot vote. In some of the other races, even where the Republican candidate won by a solid amount, the Democrat did much better and even won the absentee ballot vote in one case. We won’t know the breakdown of how many Republicans, Democrats, and Independents actually voted until about 30 days after the election – for now we just know the vote totals. Conversely, Republicans won the Early Vote in all of these races and won the Election Day vote by the most outsized margins. In the Governor’s race, Charlie Crist actually received 27,265 Absentee votes to Scott’s 24,516. In the hotly contested School Board race between Ken Marsh (Democrat) and Bridget Ziegler (Republican), Marsh received 23,985 Absentee ballot votes to Ziegler’s 21,653 votes. You can see this pattern in the less hotly contested countywide races. In the Charter Review Board race, Republican Joe Justice won overall with 54% to Jennifer Cohen’s 46%. But Cohen (24,759) received slightly more Absentee votes than Justice (24,210). Even in the County Commission race between Republican Alan Maio and Democrat Ray Porter, where Maio won a decisive victory, Porter did much better in the Absentee portion of the vote than in the Early Votes or Election Day votes. Following the analysis of the Governor’s Race in my earlier post, we move on to the School Board race. This was covered in the Sarasota Herald Tribune where they wrote about the “North/South Divide” today between voters in Sarasota county. “Even in nonpartisan races, the divide between north and south is clear. In the Sarasota County School Board race, Ken Marsh, a Democrat, won Sarasota County north of Clark Road with almost 50.5 percent of the vote, to 49.5 percent for Bridget Ziegler, a Republican. Though there was indeed a divide, where Marsh won North of Clark by 658 votes, and Ziegler won South of Clark by 3,047 votes, resulting in Ziegler’s 2,389 vote victory, it’s interesting that Ziegler overperformed Republican candidates North of Clark while underperforming South of Clark (comparing Scott v Crist numbers, and taking Wyllie out of the equation). Also, Marsh underperformed Democratic candidates North of Clark (especially in Newtown, as pointed out above), while overperforming South of Clark. Perhaps this had to do with the lack of party identification actually being on the ballot. Perhaps Marsh’s Newtown underperformance also had to do with voters there appreciating Ziegler’s support of vouchers, though there’s no way to know for sure. One of the most noticeable things about the school board race is the dropoff in votes from the top of the ticket races. For example, 24,400 less votes (or about 15%) were cast in the School Board race than the Governor’s race. Though this is not unusual, it is interesting. Click here to see the spreadsheet attached, analyzing the precincts using numbers from the County Supervisor of Elections taken on 11/7/2014. A native of Hollywood, Florida, Richard DeNapoli is passionate about law, estate planning, financial planning, real estate and the relationships he has formed through helping others in these areas. Richard DeNapoli is a native of Hollywood, FL, and a graduate of the University of Miami School of Law (2008, LL.M., Estate Planning), Fordham Law School (2002, J.D.) and New York University (1999, B.A., Politics; B.A. Italian). He was the first person in his family to attend college. He is licensed to practice law in Florida and in the United States District Court for the Southern District of Florida. In 2007, Richard DeNapoli was appointed as a Commissioner to the Florida Real Estate Commission (“FREC”), and subsequently reappointed when that term was up. Both of his appointments to the FREC were confirmed by the Florida Senate. He was unanimously elected to serve as the Chairman of the Florida Real Estate Commission from 2010-2011, and he continues to serve on the Commission today. Richard also served as the Treasurer of the Broward Republican Party in 2010, and then as Chairman of the Broward County Republican Party through December of 2012. For more than 15 years, Richard has volunteered in various capacities for Republican candidates in New York and Florida. Recently, Richard has been focusing on his professional career and on his family. Richard is married to Brigita, and they welcomed a new addition to their family, Victor Alfred DeNapoli, who was born in August 2012. 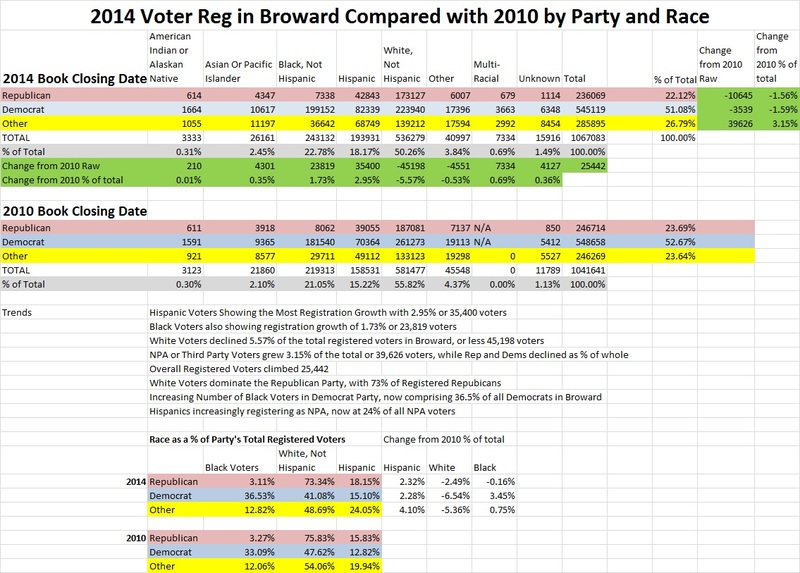 I’ve been doing some analyses of the Election 2014 results in Sarasota County. Back in August, Jeremy Wallace, of the Sarasota Herald Tribune, wrote about the “North/South Divide” between voters in Sarasota county. This trend has continued in the November 2014 elections and is visible in the Governor’s race election. Continuing a trend in the Governor’s races, Sarasota results were slightly closer, with the margin for the Republican candidate (Rick Scott) only outpacing the Democratic candidate (Charlie Crist) by about 5,000 votes. Compared to the 2010 results, the Democratic candidate (Crist) improved his margin by about 1,500 votes. So the divide holds where North of Clark is the more Democrat friendly part of Sarasota County and South of Clark is more Republican friendly.